Earlier this month I wrote a review of the Xbox 360 exclusive Halo 3: ODST on the Future Shop Tech Blog. Since then, I've tried playing the game on Legendary difficulty and have got smoked by the Covenent big time. I think I'll need to get online an play some campaign co-op in order to get the most coveted achievement. 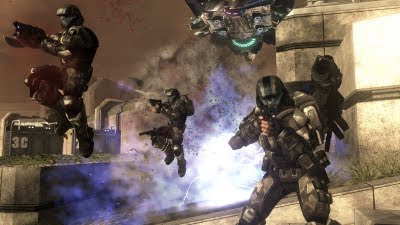 ODST is a good addition to the Halo franchise, and oddly enough my favourite part is not the campaign or the competitive multiplayer -- it's Firefight. "For long-time Xbox 360 FPS fans you'll immediately draw a parallel to Call of Duty: World at War's Nazi Zombie mode or Gears of War 2 Horde Mode. In my opinion, Firefight mode is even more addicting and provides thrill-a-minute action with varying wave-after-wave of relentless Covenant forces. The AI of the Covenant has been tweaked upward and they will now seek to rout you out with much more aggression than in the campaign. What's more, as you progress further into the match, difficulty-multiplying skulls get triggered on, making survival increasingly unlikely. If you can manage to survive for an hour or longer you'll have so many skulls active that your enemies will easily bulldoze you if make one wrong turn."